Almost anything in your fridge can work as a filling for these baked potatoes. My family lived in Norwich, England, for a couple years in the late Oughties. This city of 200,000 people sits in the middle of the bump on the eastern side of the country that points toward Amsterdam. Its history boasts many things. Norwich has the largest Roman-walled city center and the second tallest cathedral spire (315 feet, constructed circa 1145) in all of England. “Sixteen Revelations of Divine Love” by Christian mystic Julian of Norwich, written about 1393, is thought to have been the first book in English written by a woman. This is my take on this British pub fare favorite based on the leftovers that were sitting in my fridge they day I wrote this column. Wash potatoes and dry them well. Prick each potato a couple of times with a fork. Rub them with olive oil and salt. Place on a baking tray and slide tray into the oven. Set temperature to 425 degrees F. Bake potatoes until done (about 1 to 1¼ hours). While the potatoes bake, add 2 tablespoons of olive oil into a large frying pan over low heat. Add bacon, toss and cook until the bacon bits are browned and crispy. Turn heat to medium, add tomatoes, beans, stock and onion. Simmer so that liquid reduces by half. Stir in a splash of vinegar, chopped parsley, celery or basil, and dulse flakes. Remove potatoes from the oven. Cut an “X” in the top of each and push the sides so they burst open. Add an ounce of cheese to each potato, top the potatoes with an equal amount of bean and bacon mixture and serve immediately. In the 16th century, weavers came to the city fleeing religious persecution in the Netherlands, bringing with them the singing canaries who kept them company during long hours of professional solitude. By the 18th century, all of Norwich was famous for its fondness of canaries, and now the resident professional soccer team is called the Norwich City Canaries. We are dedicated Canaries fans, for sure. But the Norwich infamy we tapped most often while living there was its proclivity for neighborhood pubs and old stone churches. Local lore says the city has a church for every Sunday of the year and a pub for every other day. On Fridays during the years we resided in Norwich, my husband and I would visit a couple of pubs and offset our indulgence with a quiet repose in a historical church. A pub lunch was always involved. We typically leaned toward the pies – steak and ale for him, fish for me. But if pie was too high-end an effort for the day’s establishment, it was bangers and mash for him and a jacket potato for me. Rarely in America do you see a baked potato offered as a main course. But in Britain they are commonplace. Their skins serve as perfect “jackets” to carry both natural innards and any number of protein-packed toppings to round out the meal. Never baked in foil, a practice done stateside to preserve the spud’s moisture, starchy varieties like Cara, Maris Piper and King Edward potatoes are washed and thoroughly dried, rubbed with oil and salt, and baked naked in a hot oven so that the skins become pleasantly leathery as the tuber cooks through. Given the low cost of the base ingredient, jacket potatoes are typically generously stuffed with Heinz baked beans or sautéed mushrooms and cheese, chili con carne and sour cream, prawn and mayonnaise salad, tuna and sweet corn salad, and curried chicken or paneer cheese. I’ve recently adopted the jacket potato into my rotating repertoire of culinary tools that use up all the leftover bits and bobs in the refrigerator on the eve of market day. I’ve written before about how frittatas, pizza bases, pasta sauces and soups can all accommodate whatever you’ve got on hand to produce a satisfying meal. Just like a single sausage leftover can feed a family of four once it sits sliced atop a pizza or as all the vegetable scraps in the bin can come together to make a mighty minestrone, that last portion of salmon can go the distance if you flake it into the last of the sour cream, toss it with heaping cups of chopped cucumber and tomatoes and let the mixture ride to the table tucked inside a jacket potato. Potatoes are the No. 1 agriculture crop in Maine. 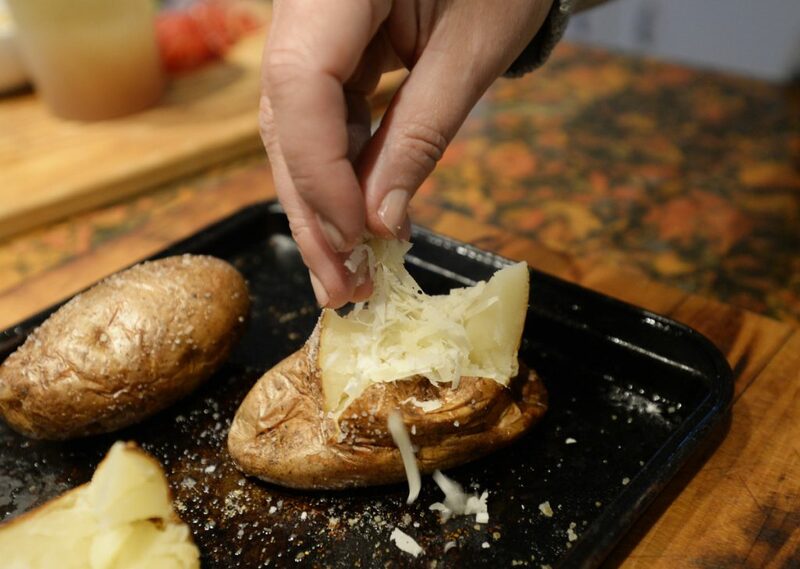 So using a good baking variety, like Green Mountain, Belrus or Caribou Russet, the newest variety developed by the University of Maine and released to the seed market, as the base for food waste-reduction jacket potatoes doubles your green-eating efforts in one easy meal. P.S. If you’re stumped on what you can make with your leftovers, send me a list of what’s in your refrigerator, and I’ll devise a jacket potato topping to suit.